Calcium Rich Foods for Bone Health: Got Greens? The dairy industry spends a lot of marketing dollars convincing us that their products are the best calcium rich foods out there, but dairy actually isn’t the best source of nutrients for bone health. Yes, dairy products are rich in calcium, but they also contain animal proteins that are actually bad for your bones. Calcium also isn’t the only player when it comes to bone health. 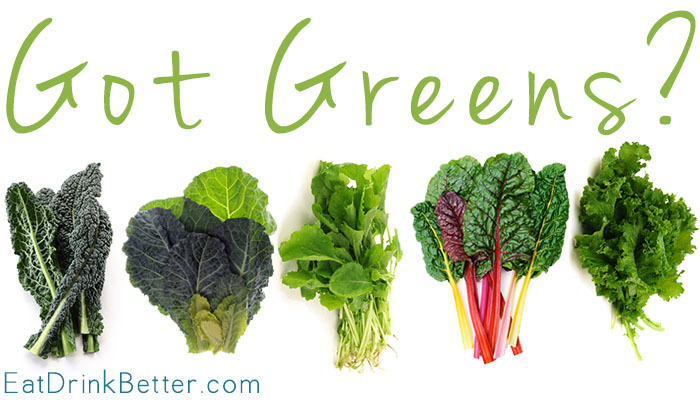 Vitamin K – a nutrient found mostly in those dark, leafy greens – is critical to bone health. Dairy products do not contain vitamin K.
Another often-overlooked vitamin when it comes to healthy bones is Vitamin D. You can get vitamin D from fortified dairy products, but you can also get “the sunshine vitamin” by just spending a few minutes outdoors each day without sunscreen. Greens like kale, collard greens, turnip greens, Swiss chard, and mustard greens give you a healthy dose of calcium plus that important vitamin K. Eat your greens outside, and you can soak up some vitamin D at the same time! Boom! Collard Greens: Eat ‘Em Raw, Just Like Kale! 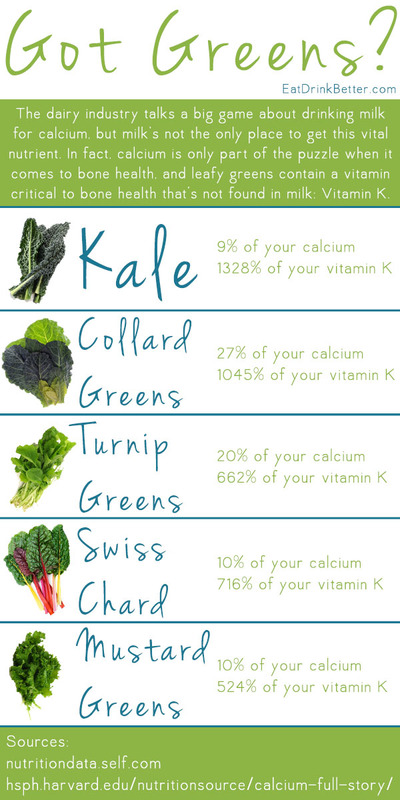 The infographic below takes a look at some common dark, leafy greens and how much calcium and vitamin K are in a one-cup serving of each of these calcium rich foods. Do you drink milk for bone health? Would you consider one of these plant-based calcium rich foods as a substitute? Eating Vegan: Where do you get your calcium? Next article The ADHD-Food Connection: Can Food Cure ADHD? Well-known phytochemicals include lycopene, found in tomatoes; isoflavones, found in soy; and flavonoids, found in fruits such as blueberries and cranberries have wide-ranging effects – some are antioxidants, others stimulate enzyme activity, and others have hormonal action. All phytochemicals act to enhance health and well-being and human performance. The phytochemicals and metabolites contained in fruits and vegetables provide an important boost to longevity and healthy living and bone strengthening and bone mass improvement. The ADHD-Food Connection: Can Food Cure ADHD?